Auf dieser 6-stündigen Tour sehen Sie das Beste der Stadt, wenn Ihr Schiff in Mumbai angelegt hat. 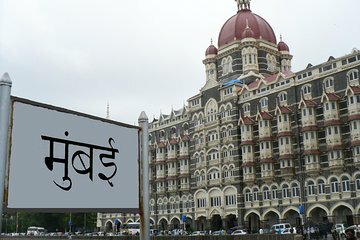 Sie reisen im klimatisierten Fahrzeug, sehen Höhepunkte wie Gateway of India, Dhobi Ghat und das ehemalige Haus von Gandhi, besuchen den zum UNESCO-Weltkulturerbe gehörenden Bahnhof Chhatrapati Shivaji und Marine Drive. Unterwegs bekommen Sie ein Gefühl für die Verrücktheit und den Zauber der Stadt, die Ihr Reiseleiter Ihnen aus einer echten Insider-Perspektive zeigt. Umfasst Transfer vom und zum Hotel und Upgrade-Option für eine private Tour. Wonderful range of activities, clearly well planned programme. The tour covered all the main sites and interesting things like the laundry located in the “slum” area. The group was 13 people and better than the coach size parties organised by the cruise line for more money. The guide was very knowledgable and well spoken. We will definitely booking more tours with you. Fantastic tour. Saw all the main sights in a small group of 13 plus the driver and guide. Sandeep the guide was great. Good value at less than half the cost of the official ship tour but actually better because the ship tours use large coaches which means less flexibility and more time waiting for everyone to get on or off.No complaints. In general it was a very good tour, and much less expensive than similar ones offered by the cruise ship. We think Viator tours in general are very good. Thanks! Our guide met us at the cruise terminal gate as planned and we joined 9 others in a mini-bus for our tour of Mumbai. Our guide was great, providing just enough information about the various sites we visited. We learned about Indian history and culture as well on our journey through the city. I particularly enjoyed our walks through the main train station and Crawford Market where our guide helped some fellow guests negotiation some purchases. The snack of Indian food at the end of our tour was a nice treat. We had adequate time at every stop to explore the sites. On the negative side, our mini-bus was a bit old, but comfortable. As the last guests to join the group, we had to sit in the raised back seats of the bus which made it more difficult to see out the windows. But in all, it was a great tour and I'd recommend it. Our guide was charming and knowledgeable and he made it very nice for my friend who has mobility issues. Without the extra help he provided for her she would have had to stay on the bus and missed many of the sights. We had an amazing day and saw much more than any excursion of Mein Schiff 5 can offer. Mumbai . The price is unbeatable. We can highly recomend this tour. After 6 hours we were back on the ship. Nobody, who books this tour has to fear to miss the ship! If your stay in Mumbai is a short one, this tour covers most of the tourist attractions. I recommend it. This was our first time in Mumbai so decided to take an organised tour we were not dissaponted. The tour showed us the real Mumbai and some tourist areas. We had a really nice lunch all in all very good. Great excursion. Guide was very good. Great price.